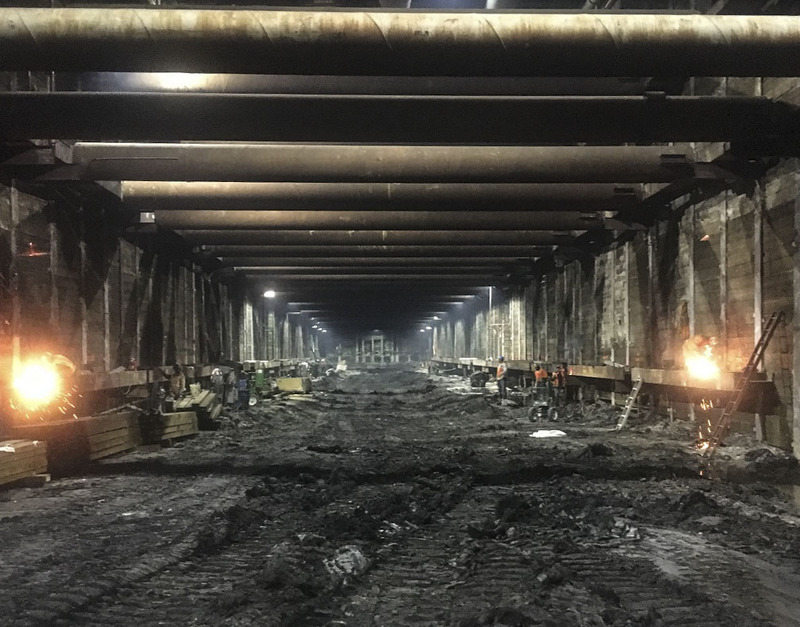 Above is some fresh video of excavation work in the future Wilshire/Fairfax Station on the first section of the Purple Line Extension that runs for 3.9 miles between Wilshire/Western and the future Wilshire/La Cienega Station. 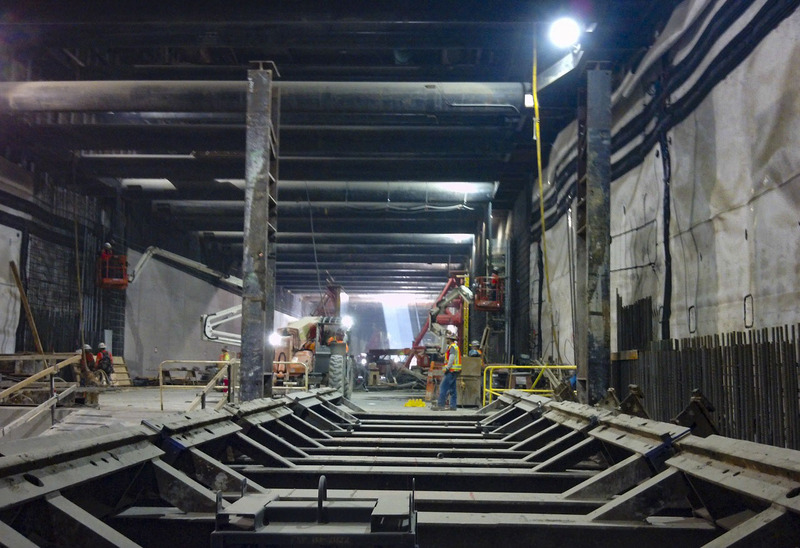 The video helps show the enormity of the station and the work involved on the project. Three other pics of recent construction work are below. 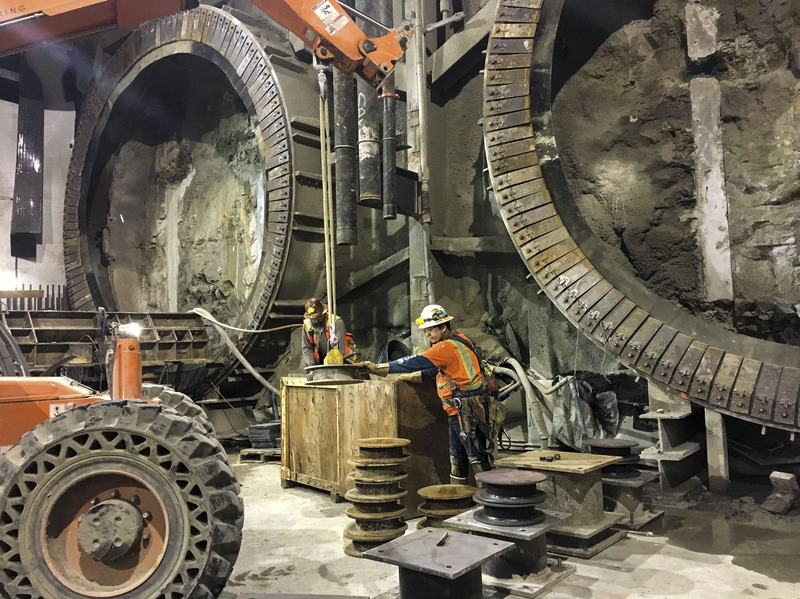 Excavation and welding at Wilshire/Fairfax Station. Assembling the cradle and frame for the tunnel boring machine at Wilshire/La Brea Station. Workers unload the base support for the cradle, which will hold the tunnel boring machine in place and guide it into and down the tunneling path. Metro should be using this opportunity to reach out to the community to demonstrate the value of tax dollars at work. I lived in Boston during the “Big Dig” when an elevated highway and light rail lines were moved underground and replaced with a park above ground. As with the work in L.A., such a mega-project taxed the patience of the community, but the city and contractors wisely held an occasional open house where the public was allowed to venture underground along walkways to view the immensity of the work. This effort was well received by the community, and Metro should make the same effort. The Purple Line Extension Project does conduct tours for community groups when requested and holds regular quarterly meetings where we share pictures of the progress. Next year when we hold our Halfway There event we will have an open house for the community at large. Please keep in touch! How about a video for how they put those horizontal wood planks in between the steel piles on the side of the station? It looks like they put them in on the bottom as they go deeper.